Is it easy to travel around Nepal? by Dave from The Longest Way Home ~ October 2nd, 2018. Updated on October 3rd, 2018. Published in: Travel blog » Nepal. How easy and safe is it to travel around Nepal? Let’s find out. Just arrived in Nepal or planning to go? It’s quite easy to travel around Nepal depending on where and what you want to do. Compared to neighboring India, Nepal is also very safe to travel around with low levels of crime. Likewise compared to it’s northern Neighbor of China it’s also easy to travel around Nepal without being “monitored” or fill out excessive visa forms. Obviously if you want to go trekking in Nepal it will involve some physical exertion. Though, you can just book a mornings helicopter flight to see Everest if that’s your thing. However do try to avoid taking a helicopter flights in and out to Everest base camp as it creates a disturbance to other trekkers and takes away from local employment on the ground. More on this later. That said, times are changing and there are some precautions and things to look out which can delay your travels around Nepal. Let’s find out some more so you can be prepared. I’ve already upset a lot of people as there are many regions in Nepal. However, as a tourist there’s the north for trekking, the midlands for culture and the south for Jungle. These are the three main feature regions of Nepal that most tourists have an interest in seeing. All three regions are relatively easy to reach. 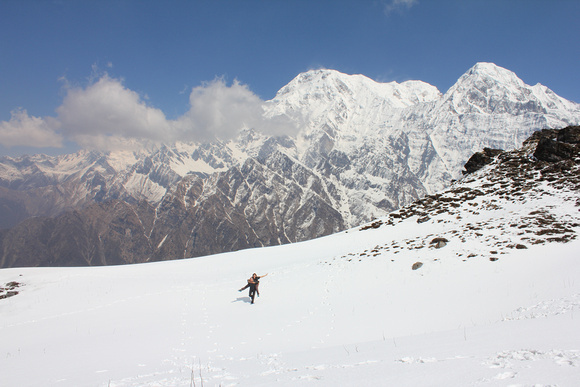 Northern: The north of Nepal is filled with mountains and Nepal’s best trekking areas. From groups to solo trekking you’ll find something here. Local buses ply the routes to the trail heads. Central: The Kathmandu Valley is where most of the cultural heritage is found (temples etc) and it’s very easy to take a taxi, hired car (with driver) or a bus. Southern: Down south in the Terrai there are huge sways of jungle filled with wildlife which are surprisingly easy to reach by tourist and local buses. Again, you’ll need to spend a day walking in the jungle to see it all. But getting there is relatively easy. To the east and west of Nepal are more remote areas with road conditions that vary every year. These areas are starting to gain some attention for cultural treks and little known heritage that’s well and truly off the beaten path. Take a look at my guidebooks to Nepal and you can discover how to reach far off places in Eastern Nepal. Here’s more on planning a trip to Nepal. All this being said, Nepal does not match international standards when it comes to getting traveling around. So, you’ll need to treat everything as an adventure! Most journeys in Nepal are more tiring than you can expect. Delays, crowding and rough roads are taxing. A simple 100 KM journey can take up to 10 hours! Here are some insider tips so you’ll know what to expect. Air – Nepal’s domestic airways reach all corners of the country. For tourists you’ll be paying more than locals. While you can book some online, I don’t recommend it. Buy from a travel agent. If there’s a weather cancellation it’s a lot easier to reschedule or get your money back than dealing with the airline itself. Today Nepal’s obsessed with helicopter travel to Everest with plenty of “canceled plane flights due to bad weather” adding to the debacle of money making scams hitting the country recently. Traffic jams in Nepal are frequent annoyances to travelers as they add hours to a journey – the main go slow areas are coming in and out of Kathmandu and Mugling (on the way to Pokhara and Chitwan). Keep in mind the following. Banking regulations in Nepal mean money technically can’t leave the country. So if you are buying a ticket online chances are it’s being rerouted overseas somewhere. So, you can already tell there’s a potential for issues. Also, do be aware of the helicopter rescue scam in Nepal to get an idea on how to avoid it. Railway – Don’t believe the hype. There are no railway networks in Nepal for tourists to take. There’s talk of it happening, but we are looking at about 10-15 years in the future. Bus – this is the most popular method for mid and long-distance travel in Nepal. Cheap but rather battered buses will take you just about anywhere. Do be aware that in July 2018 Kathmandu’s main tourist bus stop going to Pokhara and Chitwan moved to Sorhakotte (again my guidebooks are the only ones with this up to-date information). Private car – taxis in places like Kathmandu are cheap and plentiful. You can afforaby take them to places like Patan, Bhaktapur and Boudha. However, any further and you’ll probably prefer a bus in terms of cost. Hiring a car and driver is also possible, but not cheap. There are no self-drive car rental options in Nepal. Here’s more on how to travel around Nepal. Is it safe to travel around Nepal? Yes, Nepal is a safe country to travel around. But like traveling anywhere, you should be aware of some things. Personal safety: There are no outstanding acts of violence towards tourists. It is much safer to travel alone in Nepal and to travel Nepal solo as a woman in Nepal than India. That said, places like Kathmandu and Pokhara now have 24 hour bars so alcohol, pickpockets and bag snatches are on the rise. Don’t let your guard down and you should be okay. Do also be aware of “charming men” in Nepal looking for romance. There have been reports of long-term scams and heartbreak. Road transport safety: Nepal’s roads are not that great. Generally they suffer from bad maintenance and constructions. Ignore the yearly speech from trekking agents and hotels saying the road was just repaired – the truth is they are “always being repaired”. Tourist bus accidents are very low though. Most accidents involve mini-vans (used as small buses) in mountainous areas. Drink driving is increasing. Again, don’t believe the hype tour companies put out about Nepal being a year round destination. Sure, you can visit at any time of year. But I certainly wouldn’t be taking any buses to landslide prone areas during the monsoon seasons. 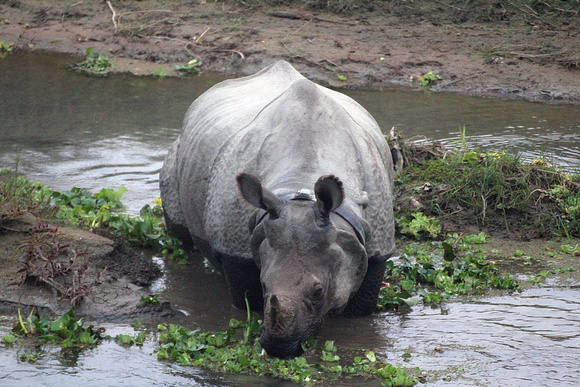 Read more about visiting and staying safe in Nepal during the monsoon season. Air safety in Nepal: The safety standards of Nepal’s airlines has been in question for many years. Airplane crashes have happened and are often due to weather issues rather than pilot error or equipment failure. In recent years an emphasis has been put on delaying flights rather than flying in poor visibility. Nepal has recently been granted access to European airports again. In 2018 insurance companies uncovered a Nepali based helicopter / trekking / hospital insurance scam in Nepal which is important to read about before going. Food & Hygiene safety: Disinfectant is not widely used in Nepal and hygiene is an issue in many places. Tour companies have been promoting “street food” which has led to many an upset stomach due to sanitation issues. Many of these “food tours” are far from the standards you will find in places like Thailand. Do exercise caution and avoid street food in Nepal if you have any inclination of a weak stomach or bacterial infections. Discover more about food in Nepal. Crime in Nepal: We touched on crime above. Although Nepal has the reputation of being “corrupt”, tourists are not likely to see this side of things in person in terms of bribes and the like. Bag snatching is starting to occur in Thamel at night and in Pokhara’s lakeside – this is mainly opportunistic due to the relaxed nature of Nepal and is far from rampant. Violence is rare in Nepal though national pride is high so keeping ones opinions to oneself should be heeded. Momos from a roadside local cafe … hot and good. 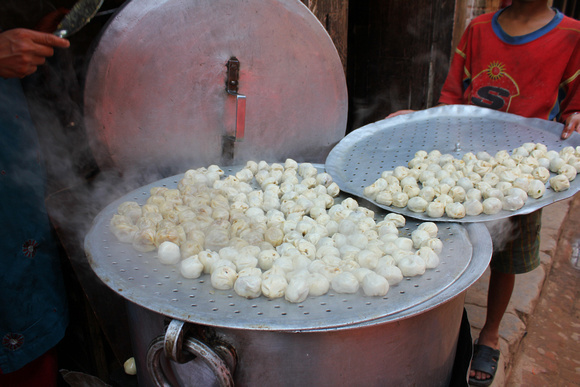 Just be aware that the plates were likely washed with ground water so if you have a weak stomach it can result in problems … likewise these types of momo are high in fat which is not so healthy – do be careful with street food in Nepal as hygiene is a serious issue compared to many other countries in Asia. 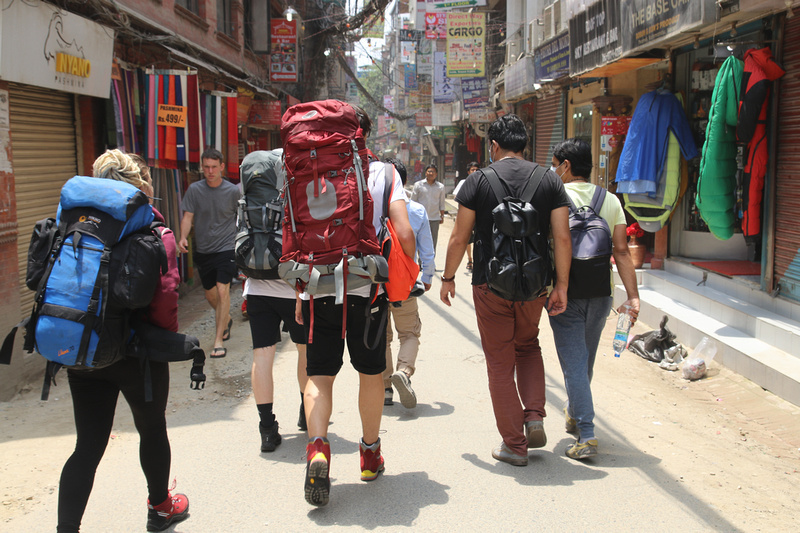 Overcharging tourists: This is one aspect to Nepal which is on the rise. Overcharging tourists has always happened in Nepal but in recent years things like the helicopter trekking scam have only highlighted the problem, not solved it. Being charged 3-4 times the price for an entrance ticket is openly displayed. Likewise during festivals when areas are crowded tickets are still issued to tourists. Discriminatory pricing of “westerners” is common and largely accepted in Nepal. Always ask for a receipt when paying for something in Nepal and by all means voice your opinion on it via embassies or the tourism board in Nepal. You can read more about scams in Nepal here. Pollution in Nepal: Finally it’s worth noting that pollution is a problem in Nepal. Most of this is caused by industrial chimneys, wood fires, incinerators, unsurfaced roads, plastic burning and vehicles. These days it’s very common for people to wear dust masks in Kathmandu during the cold winter months. When trekking there is very little pollution. Communication: The most common difficulty is often communication issues. While largely English speaking not everything is clearly “understood” in Nepal. Mistakes are often made when booking something. Always ask twice if you are unsure and if possible get it in writing. Bus seats: The Kathmandu to Pokhara bus seat scam was highlight here in the past. It’s still there but the bus companies and conductors now know that tourists are also in the “know”. Rather shamefully they are still trying to take advantage. Again, read about it before going to be prepared. Delays: Transport delays are normal due to traffic jams and landslides. 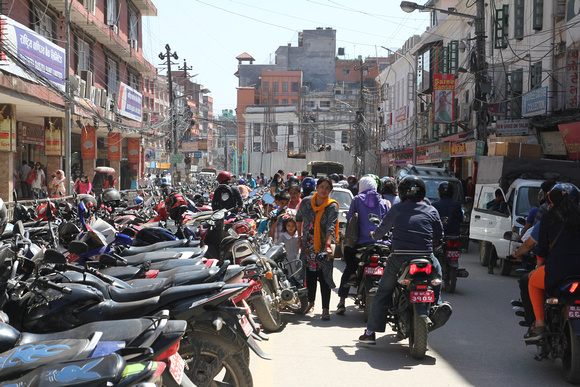 Coming in and out of Kathmandu means traffic jams. Expect delays. Landslides outside of Kathmandu normally happen during the monsoon season. They block roads more than damage vehicles. Road delays are frequent during this time of the year. Stomach problems: Food hygiene in Nepal often means a bout of stomach problems. This can largely be avoided by eating in popular busy restaurants in Kathmandu and indeed throughout the country. Water is often a problem so stick with sealed bottles or high quality bottled water and not the cheapest bottles sold in many of Thamel’s supermarkets. Altitude sickness: Many people contact me about getting a trek done faster. It’s a huge mistake. Everest Base Camp is 12 days. Don’t shorten it and don’t listen to any tour company that says you can do it faster. They are basically scamming you. Likewise if the price is too good to be true, it’s likely got an unpleasant catch that you’ll have to pay for later. Do read more about preventing altitude sickness when trekking in Nepal. Nepal is wonderful captivating country that is very easy to travel around- the biggest issues tourists face are transport delays, altitude sickness and being careful where to eat! Many Nepali trekking companies are now promoting faster cheaper treks. Please don’t believe them. You are endangering your health by skipping acclimatisation days or falling for a scam type trek that ends early by using travel insurance to call in a helicopter. Go with with a recommended company and read first about the recommended days for the trek you are going on. No matter your trek, read about the recommended trekking days needed in your independent guidebook – not on a tour companies website. All in all, traveling around Nepal is very safe. It’s not luxurious. It’s not a rock bottom budget destination. However, it is a safe, fun and exciting country to visit with nearly an incredible number of places to discover. Treat it like an adventure and you’ll have more fun! Have you every eaten anything that made you sick when trekking? When trekking, no. In Kathmandu, yes. When trekking I eat Dal Bhat because 90% of everyone is eating it and so it’s fresh. Thanks for the tips! Coming in November. Your advice has been invaluable. Just wanted to let you know we read your book and the Pokhara to Kathmandu bus seat scam is so true!! We did what you wrote, sat back and watched other travelers be sent to the back of the bus. We were the only westerners up front!!! Yes, it’s a shame this continues on unabated. It could be so easy to stop if people just numbered the seats, however by doing so they don’t make “tips”. Loving this advice David. I spent a month in Kathmandu. Loved it. But definitely guys; hygiene is an issue. I had the runs literally all month LOL, although no vomiting thank goodness. The best thing to do is eat in recommended restaurants in Kathmandu. Are the local buses still really small? We were in Nepal about 5 years ago and loved traveling independently but the bus seats were too painful for our long legs. I read somewhere that there were all new buses in Kathmandu, is that true? Despite some people saying there are new buses … the reality is two fold. Yes there are larger local buses now. However, by my estimation there’s only about a 20% chance of getting one as the older ones are still running. Do you recommend taking our passports and wallets with us when trekking or leave them in a hotel safe? I recommend you take your passport and wallet with you. Wrap them in a dry bag and keep them safe. One thing that caught my eye was the pic where so many people in that picture… must be thousands, spectacular…. 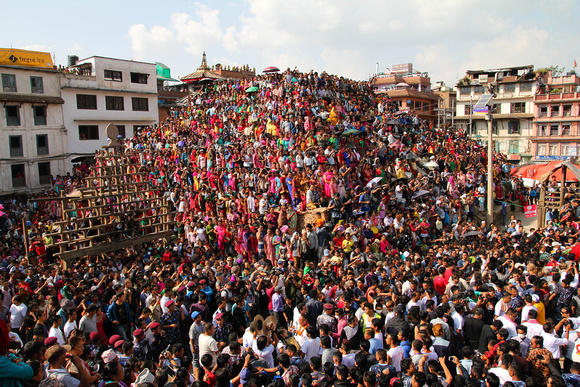 That photograph is from Indra Jatra. Just booking to come next year – this has been fantastic advice – thanks! Glad the advice has helped.